With the Lok Sabha elections fast approaching, many citizens in Kerala alleged that the LDF and UDF were trying to gain votes through the Sabarimala protests. The double standards of both the parties over the Sabarimala temple has also been proven, they alleged. 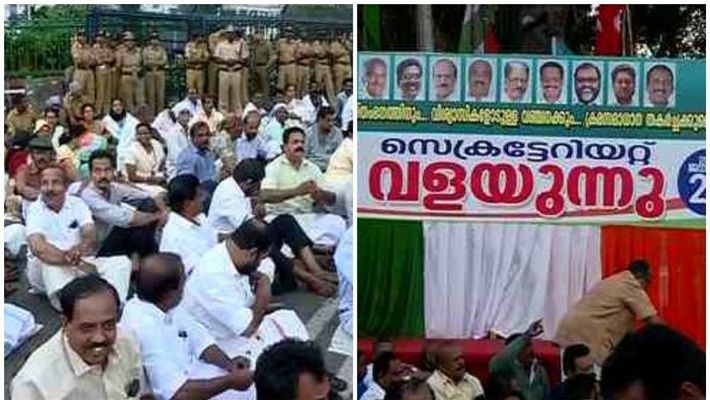 Thiruvananthapuram: The UDF has organised a protest alleging non-implementation of flood relief and rehabilitation work and law and order breakdown in the state. The UDF workers are agitating at the secretariat and at the district collectorate's office. The Opposition leader Ramesh Chennithala inaugurated the protest. "After being exposed with their double standards on the Sabarimala issue, the UDF is now looking at protesting and demanding relief for flood victims just for sympathy. The leaders have a new drama to stage every day," said Aswanth Aravinthan, an Ayyappa devotee from Kannur. With the Lok Sabha elections fast approaching, many people in Kerala alleged that the LDF and UDF were trying to gain votes through the Sabarimala protests. The two-faced nature of the parties soon came to light, they said. Earlier, the Congress protested against the Sabarimala verdict, but later its party worker SP Manju entered the shrine on January 8 and hurt the sentiments of the devotees. Kerala chief minister Pinarayi Vijayan's hypocritical side too was witnessed with the arrest of three women, who tried to enter the Vavar mosque. All this at a time when the government has been encouraging women's entry into the Ayyappa's abode. Meanwhile, Chennithala announced Rs 4 lakh as financial aid for the family of Sanil Kumar, who allegedly died of pesticide poisoning. The Congress decided to offer financial assistance through Gandhigraham house project. So, Sanal's family will get a house. "Chennithala failed to provide any such compensation for the family of the devotee, who died during the Sabarimala protests. He cares about farmers suddenly to get sympathy votes for the upcoming Lok Sabha elections," said Anand Sudhir, an Ayyappa devotee from Sharjah. The verdict of the apex court on September 28 allowing the entry of women of all age groups into the famous shrine had made Sabarimala a combat zone. "As an Ayyappa devotee, I feel humiliated when I think of what is happening in my state. What else can we expect when a state is being headed by a chief minister, who is a liar," said Rupesh Chirakkal, an activist.